There’s no getting around the fact that Horrors of War is a sequel. It’s very much Part Two of an ongoing story, begun in Men of War, a First Doctor story in this new range of audio adventures for Doctor Who. In that first part, something had gone dreadfully wrong in the trenches of World War I, which meant the First Doctor having to passionately advocate for the beginning of the Somme campaign, with all its attendant bloodshed. At the end of that story though, we got an enormous clue as to what might be going on – but the First Doctor was unable to control the Tardis expertly enough to fly exactly where he was needed in order to address that situation. It became one of those odd situations where mysterious would have to be left for another occasion in the Tardis’ erratic flight through time and space. Two lifetimes on, the Third Doctor and Jo Grant (played by Katy Manning, who reads this story) find themselves at Ypres in 1914, with a nurse who may just possibly have knocked history onto an alternate course. Justin Richards, in Men of War, achieved a very particular kind of creepiness, of men and screaming and death but also of time as the enemy, time as a factor in the drama, that reminded people of a certain age of the Sapphire and Steel stories, and there’s more in a similar vein here, while having the scenario change utterly. There’s a wounded soldier who screams of inhuman things, there’s a trip to see exactly what happened to push history off its axis, and there’s a ghastly confrontation with a Thing that’s entirely self-consumed, entirely all-consuming, hiding behind a human face. But whose human face? That’s the question – what is the catalyst for history gone skewiff? Who has picked up something they shouldn’t have, and why is it forcing men to die and not die and do its ghastly bidding? There’s a real sense of the Third Doctor’s era in Richards’s story here – in fact, there’ll be moments when Pertwee devotees will wonder whether the villain here is actually one that appeared on-screen – and Manning is, as can always be said of her, enormously good value for money, voicing all the characters in the story with a conviction that sells the drama and the heartbreak of their situation utterly. The story serves up a good line in red herrings too, drawing you in and making you jump from conclusion to conclusion as you try and pin down exactly what’s gone on. You might get close, but Richards’ villain is such that you’re unlikely to guess it with any precision ahead of time, so it’ll still deliver riches in the form of surprise and learning when you finally find out what’s happened. 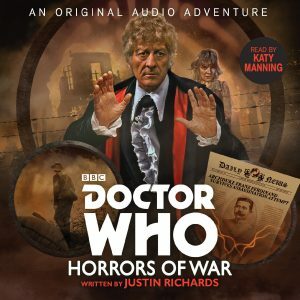 As with Men of War, Horrors of War has a sting in its tale though, pulling us on to hear the third instalment of this wartime story, Fortunes of War, starring the Sixth Doctor, when it’s released in early September. What began as a seemingly simple story of the First Doctor investigating oddness in the trenches builds in Horrors of War to something with a more epic and adversarial status, and makes the whole ‘War’ arc something to be collected and listened to time and again, not only for the quality of each individual instalment (and Richards is absolutely no kind of slouch in delivering quality Who), but also for the broader canvas, the deeper themes and the impact of the Doctor flying off each time thinking he’s done what he can do – and sometimes, being wrong.